The Cambodian government said Tuesday that Radio Free Asia is welcome to reopen its office in the capital Phnom Penh, asserting that no pressure had been applied to RFA to shut down last year and that the congressionally funded U.S.-based international broadcaster had chosen to close on its own. Political dynasties are taking shape as the children of ruling party elites, including PM Hun Sen’s offspring, are promoted to positions of prominence and power. European Union countries failed on Tuesday to determine whether to impose tariffs on rice coming from Cambodia and Myanmar from the start of next year to curb a surge in imports, leaving the European Commission to take the final decision. Last month, the UN-backed Extraordinary Chambers in the Courts of Cambodia (ECCC), more commonly known as the Khmer Rouge Tribunal, delivered a verdict against two former leaders of the Khmer Rouge, Nuon Chea and Khieu Samphan, convicting them of genocide and crimes against humanity. But there is nothing “extraordinary” about this outcome. King Norodom Sihamoni and Prime Minister Hun Sen marked the International Day of Persons with Disabilities on Monday by celebrating the progress made in Cambodia on disability rights. Newly constructed dams threaten the delicate ecosystem of the Lower Mekong Basin … invoking significant consequences for the Vietnamese and Cambodian agriculture industry. A proposed amendment to Article 45 of the Law on Political Parties seeks to allow individuals barred by the courts to re-enter politics before the term of their ban is complete if they receive a concession from King Norodom Sihamoni. Cambodia’s government on Monday outlined a plan to “strengthen democracy and political space” in the country following a divisive election, but observers said the proposal is aimed at alleviating international pressure and does not go far enough in rolling back restrictions put in place ahead of July’s ballot. Demining NGOs have given the thumbs up to the government’s effort to make the Kingdom mine-free by 2025 which were highlighted to the world during an official visit by a Cambodian Mine Action and Victim Assistance Authority (CMAA) delegation to Switzerland last week. Cambodian Prime Minister Samdech Techo Hun Sen’s visit to Vietnam from December 6-8 is sure to be a success, helping enhance the traditional friendship between the two countries, according to a Cambodian official. Exiled former opposition leader Sam Rainsy has been appointed as the acting president of the dissolved CNRP pending the conclusion of the treason case against Kem Sokha. The joint Cambodia-China Golden Dragon 2019 military exercises will be carried out on a larger scale than this year’s in Kampot province’s Chol Kiri district in March, a Royal Cambodian Armed Forces commander said yesterday. In his message on celebrating the 40th anniversary of the Kampuchean United Front for National Salvation, known by its French acronym FUNSK, Prime Minister Hun Sen said for the sake of unity in the Kingdom, he is “tolerant” to those who “acknowledged their mistakes”, and that he may be the “only leader” to exhibit such a trait in Cambodian history. Cambodia has seen remarkable improvements in labor standards in the garment and footwear industry, said an International Labor Organization (ILO) report released on Tuesday. The Office of the Council of Ministers (OCM) has approved plans to improve and add capacity to water treatment facilities in coastal and construction areas, sewage systems and mud drying facilities in Sihanoukville after they were inspected and assessed by government institutions. The Cambodian Mine Action Centre (CMAC) cleared more than 30,000 land mines from 75sq km in the first 10 months of this year, the organisation’s director-general said on Monday. Retail petrol prices in the Kingdom continued to fall on Monday amid an increase in crude oil prices in the international market. South Korean investors may look further into Cambodia’s food processing and agriculture sectors instead of its technology industry said the Asean-Korea Centre (AKC). Cambodia celebrated here on Tuesday the 25th anniversary of the founding of the International Coordinating Committee for the Safeguarding and Development of the Historic Site of Angkor (ICC-Angkor). Cambodian Prime Minister Hun Sen pledged cooperation with the international community to preserve temples in Cambodia as tangible cultural heritages. Qatar has signed agreements to bring in domestic workers from Vietnam and Cambodia to the country. The Asia Entertainment and Investment Expo 2018 concluded in Phnom Penh on a positive note last week, with potential sales hitting the targeted $50 million and investors expressing confidence in Cambodia’s business sector. Today’s diary entries come from Chanleakna and Monita, two girls who live in different parts of Phnom Penh, the bustling capital of Cambodia. 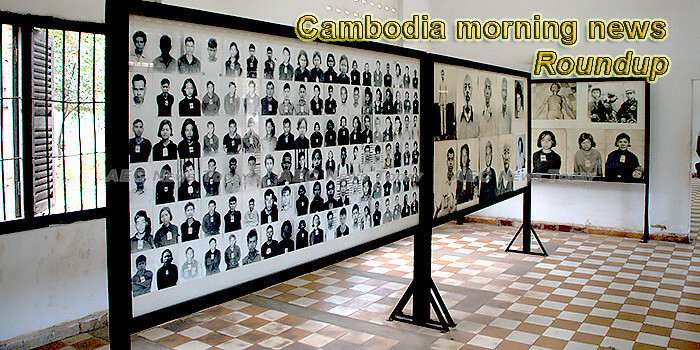 This week’s Cambodia morning news feature photo acknowledges International Day of Commemoration and Dignity of the Victims of the Crime of Genocide and of the Prevention of this Crime, December 5.